If you want to spend up to 550 US-Dollar (!!!!) you have to search for this 12-Inch record. Not only very expensive but also a very good song. Real ITALO! This is italo-space-disco at its best - and as usual always hard to get. Ready to fly?? This is the amazing italo disco version of the John Carpenter movie soundtrack, a real classic, performed by the German Splash Band, highly recommended! This is a highly respectable vocoder electro track from Jamie Jupitor, produced from the big Egyptian Lover. There is a re-release on vinyl from 2002, cheaper to get than the rare original. Enjoy the Computer Power! An amazing classic from Francesco Boscolo and Beppe Loda as MC1, DJ of the legendary Typhoon club. The record has been re-released in 2006 by Synthonic from Italy so you might find cheap vinyl versions of it. This is another highly influential italo space disco track, the only one produced by Cyber People in 1984. This is the first side of the amazing Lama 12 inch from 1983, the second side, Love on the rocks, I posted before already. Listen to the lyrics and "follow the sound of the universe" - perfect italo space disco! This is a real new age kraut space electro monster, originally 10:47, NOT FROM THIS WORLD! I love it! Amazing track from the Flashback album, with Sting as vocalist! I recently received some questions about the differences of cosmic disco, space disco, italo disco, electro disco, electronic disco and how I see it. I am not the guy to write Wikipedia articles about this, but I try to explain how I and my fellas, The Robot Scientists, see it. 1. "Cosmic" disco: heavily used especially on ebay to describe a certain type of records. It actually is not a real genre. It refers to the discotheque named "Cosmic" at the lake Garda in Italy where DJ Daniele Baldelli was spinning "a very diverse range of musical styles, from electro and funk to jazz fusion and Brazilian music" (wikipedia) in the 70s and 80s. Read more on wikipedia about "Cosmic Disco" . 2. "Space" disco: Wikipedia says it is a real genre, "a short-lived Euro Disco variation associated with synthesizers and science fiction themes". I don't think science fiction themes have such a big influence. Let's put it that way: with the first emerging synthesizers "for home use" in the mid 70s, artists like Klaus Schulze (1975) and Kraftwerk (1976) in Germany, Cerrone, The Rockets, Milkways, Space and The Droids in France (1977), the Universal Robot Band, Meco and Space Project in the U.S. (1977), Gino Soccio with his Kebekelekrik in Canada (1977) and Automat in Italy (1978) started to create "electronic disco" music. The one who made this sound popular was the Munich based producer Giorgio Moroder from South Tyrol in Italy, also in 1977. Space disco is an artistic, aural expression of the new computer/space flight/synthesizer age that had arrived, it is the soundtrack to the futuristic dreams of these times. 3. "Italo Disco": again, a real genre, encompassing mainly the electronic disco tracks from Italian producers from the years 1983 to 1986. The name "Italo Disco" was invented by the owner of the German label ZYX, Bernhard Mikulski, who used the term to promote his licensed versions of Italian electronic disco artists on the German market. I guess the breakthrough for the term came with this record - it became a big hit in Germany, and from then onwards, people knew what Italo Disco is and how it sounds like: Hipnosis - Pulstar. Experts wrote a lot more about Italo Disco on wikipedia. 4. "Electro" and "Electronic" Disco: not a real genre - at least so far. 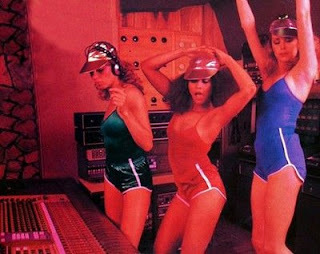 Compared to classic disco music, electro(nic) disco is made with synthesizers and drum machines instead of real instruments. The first records emerged in the 70s. So I would say that all WE love is electronic disco from 1977-1983 with a space disco touch, with lots of great tracks coming from Italy, France and the U.S.! As European I want to state here that all these Italian, French, Canadian, U.S. American and German artists can be very proud: through their space disco and Italo disco music, they paved the way for the later on so-popular Chicago house sound - they actually were the godfather-like artists that influenced people like Derrick Carter, Frankie Knuckles, Larry Heard, Ron Hardy et al! MAXIMUM RRRRRESPECT for that! Electronic music enthusiasts around the world do realize these days how influential Italo/Space Disco artists were, just by following blogs like this and hundreds of vintage DJs that dig out old classics, re-edit them, put them into their mixes like The Robot Scientists and many others. And this is the reason why original vinyl records from these days are now more sought after - and more expensive - than ever. And with the crash of the financial markets, the world seems to be on the verge to a new age, similar to back then, when the first space flights happened and music was played by computers for the first time...not sure, just a gut feeling...the new age 2 is coming...and futuristic electronic disco suits fine as soundtrack...although the upcoming change will not be driven by new technology...rather by human intelligence and new ways of thinking as people realize that we need this planet but the planet doesn't need us...I get too philosophical now! Time to party with some German fellas, see my next postings!